This Therapeutic Hospital Mattress is centered around "Dynamic Dispersion technology" where each air and foam filled baffle communicates to create exceptional envelopment and pressure redistribution. Each zone is is sealed in order for air to be the primary support within each zone. The quilted cover is waterproof, breathable, fire retardant, and antimicrobial. 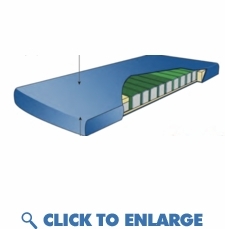 The advanced hospital mattress also comes with a firm edge perimeter and soft heel section. This fusion therapy hospital mattress creates an environment for prevention and therapy. This hospital mattress system supports 500 lbs and comes with a 5 year warranty. Heals and prevents up to stage 4 bed sores and pressure ulcers! No pump required, No cells to replace! This can be converted to a low air loss mattress if necessary by add a true low air loss pump This mattress system can be converted by adding the true low air loss pump if ever necessary. This Therapeutic Hospital Mattress is centered around "Dynamic Dispersion technology" where each air and foam filled baffle communicates to create exceptional envelopment and pressure redistribution. Each zone is is sealed in order for air to be the primary support within each zone. The quilted cover is waterproof, breathable, fire retardant, and antimicrobial. The advanced hospital mattress also comes with a firm edge perimeter and soft heel section. This fusion therapy hospital mattress creates an environment for prevention and therapy. This hospital mattress system supports 500 lbs and comes with a 5 year warranty. Heals and prevents up to stage 4 bed sores and pressure ulcers! No pump required, No cells to replace! This mattress system can be converted by adding the true low air loss pump if ever necessary. � The foam and air-filled baffles communicate to evenly distribute the patient�s weight over the entire therapy section. � Unlike �Self-Adjusting Technology� DDA dynamically conforms to the patient and readjusts each time they change positions. � Each positional change creates a new custom fit. � Sealed air chamber is preset and requires no adjustment. � Air support provides therapy and comfort and enhances the life expectancy of the foam by supporting the majority of the patient�s weight. � Modular design allows for replacement of damaged or worn sections.